Oh man, I love the colour brown. Why, I don't know, but I just do. Prize Winning Mare is a brown polish with gold shimmer. 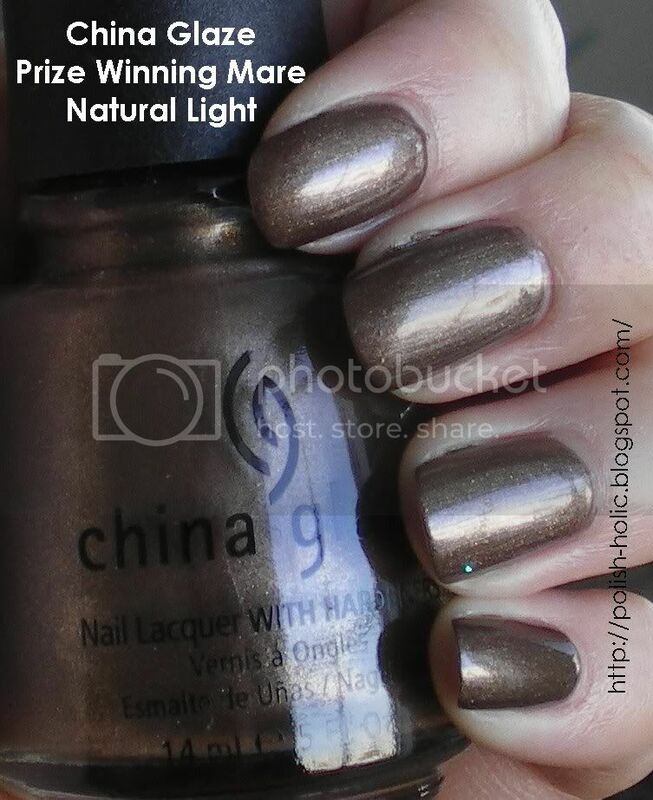 This polish makes me want to burrow in a pile of blankets and never leave. It's so fantastically warm. I'm surprised I like it, as I'm generally more into the cool colours. This is two coats with no top coat. This polish is a bit thin, but it's perfect after the second coat. Other than that, there wasn't really much else of note in application. Pss, ignore that random sparkle on my ring finger. You can really notice it in the natural light picture. While making my way to the window to get the pictures, I smacked my hand against a Christmas ornament hanging from my bed and a sparkle attached itself to my still slightly wet nail. 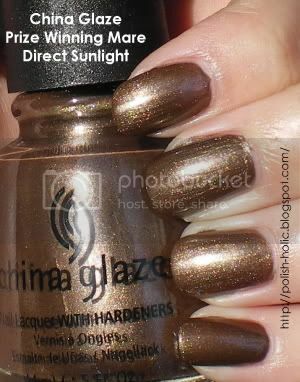 The Rodeo Diva collection by China Glaze, which is the collection this polish is from, is sort of amazing. It's just got one winner after another. If I can remember correctly, the next polish is also from this collection. It is a stunner. oh this one is sooo pretty! like sparkle coffee!!! Hahahaha, sparkle coffee. Leave it to you to come up with that type of description. Hurray!! Thanks for swatching the one I asked for!! This is so pretty, I want to get it! I don't usually go for straight brown polishes, but this one is just too awesome.. In fact, in a perfect world I would just own the entire Rodeo Diva Collection! Lol. Thanks again =) Made my day to see my name on your blog!!! Hahaha! I'm glad you like. And yes, in a perfect world, we would both own the entire Rodeo Diva collection. That is a lovely brown! The gold/brown does look great on you! Kelly: Thanks, and who would have ever thunk the colour of poo could look so good.